Coincidence we did allmost the same post at the same Time ? Shhhhhhhhhhhhh! People will figure out the conspiracy! NAJ, I could swear you mirrored my first boat. I've had this discussion about lowes luan before and just happen to have a pic. The top piece is what I used to build my first boat. 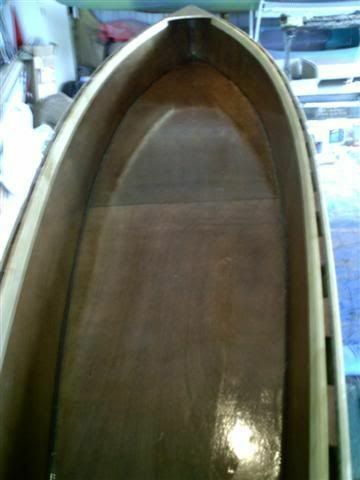 It soaks up poly resin like a sponge and isn't really good for boat building. The lower piece is exactly what Jem described and what I used on my pirogues. Thanks for posting that piccie mate. my eyesight isn't good enough for macro shots like that. The top piece has the same sort of cross section as my cheap blonde ply. I have bought my last sheet of that stuff. The bottom piece, with the 3 actual wood laminations and the black glue lines betwen, indicate to me a far superior grade of ply. The black glue lines between laminations, indicate - water resistant (at least) glue. Here in the UK the exterior stuff is sold as WBP (water/boil proof) - I don't intend to boil my boat but apparently it would stand it. This should have the waterproof glues but is exaclty the cross section of the top board. It's waterproof but not very nice stuff. It is cheap though, so it is going into my first boat. Proper marine ply seems hard to get here in the UK at anything like a reasonable price. I did find one supplier but it was a minimum of ten sheets. "I now have 2 slightly shorter fingers on my left hand"
I guess some mothers do heve em. Some guys are good enough craftsman to use (selected pieces of) cheap plywood. I'm not. And, I really hate to go out in deep water with a hull made of cheap stuff. Kinda reminds me of being a steeple jack, climbing on high places, with the cheapest safety belt I could find. 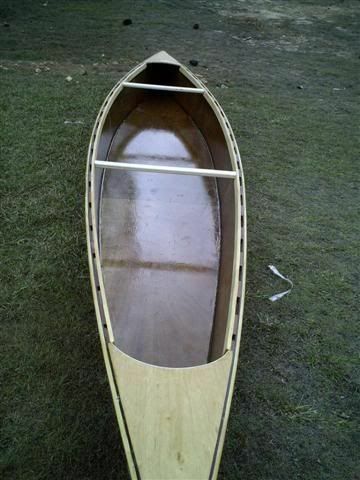 UK Newbie here looking at having a go at making my first boat but I am due to move to Germany in weeks few and I want to get the wood now rather than in a country where I dont speak the language. I have done some phoning around and marine ply and timber merchants who will take you seriously are both hard to come by. I also am quite busy and I have some boatplans.dk CAD files for the shapes which he said a cnc miller would be able to cut. Long story short I spoke to the timber guy at a B&Q warehouse store after rembering that they nicely cut up some MDF for me a few months ago all by computer. He tells me he has some WBP eastern asia ply at a very reasonable rate and that his computer will take the plans and cut it all to shape for little extra cost! I am yet to do this but I am going down to see him and take the files down tomorrow and I will make an informed decision soon. I will of course share my experience on here. Does anyone have experience of a similar service or of B&Q ply? I don't know anything about the capabilities of your CNC bloke or what is involved in setting up his machinery to cut from your plans. Sorry mate. Here is a piccie of what the ply we call Exterior bracing ply comes out like. -Look at the edges of the ply. It should have no voids. Sometimes you can take a powerful flashlight and hold it directly to one side of the ply to see if you can see vois through the other via brighter spots. -Look at the glue between the layers. It should be dark brown or even black. -The best wood will have multi plies (amount depending on overall plywood thickness) and the plies will be the same thickness. -Any identifying stamp on the ply will be helpful for you to trace it and verify species. Hope that helps! Let us know your outcome.